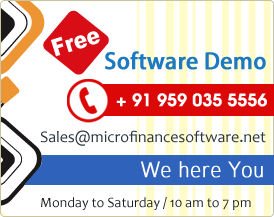 Microfinancesoftware.net Microfinancesoftware.net is the Best Micro Finance Software provider in Bangalore and aboard. We provide the best Micro Finance Software. Contact us immediately for a free demo. There are more than hundred fields to enter a client’s information. For credit products one can enter unlimited products. This Software has 3 Types of interest calculation: flat, Declining Balance-Equal monthly installment (EMI) and Declining Balance - Equal principal installment. We are also provided all type of Loan, RD FD, Mortgage, Pigmy, Vehicle Loan, Gold Loan, Banking, NBFC, Co-Operative, Billing, Personal Loan, Education Loan, Home Loan, Property Loan, Agriculture Loan, Commercial Loan, Payday Loan, Micro Finance, Website Design, and Website Development. We also Provide Website Design and Registration, Maintenance, Suggestion also. Microfinance Company for creating such a useful product. It has streamlined and enhanced the quality of our service and it is very good to expand the business. Our Company understands that business value cannot be achieved through technology alone. It starts with people experts working together to get to the heart of your individual business objectives and develop the most adapted solutions to fit these requirements. We believe this human-centered approach to technology is what makes the difference for your business. Loan Disbursal Entry -Record group wise (WT/SHG) loan disbursed with amount installment details of each member availing loans. Receipt Entry - Record and print receipts to members for recovery towards loan principal and interest amount. Payment Entry - Record payments to suppliers and other expenses. JV Entry -Record Journal Vouchers. Interest Calculation - Foreclosure of loan. Penalty Interests - For overdue accounts, defaulters. Microfinance is a form of banking service that's offered to unemployed or low-earnings individuals, or businesses that in any other case haven't any different access to economic services. Eventually, the intention of microfinance is to provide low-sales folks and possibility to turn out to be self-ample by means of delivering a method to save cash, borrow cash and get coverage. Microfinancing supplies options to patrons with limited resources to advertise participation in productive routine or to support a small trade. Whilst tuition participating within the discipline of microfinance is most as a rule related to lending, some microfinance corporations offer further services, together with financial institution bills and coverage. Additionally, some institutions provide knowledge within the areas of fiscal literacy, comparable to working out curiosity charges and managing financial risks. Microfinancing just isn't a brand new notion. Small microcredit operations have existed on the grounds that the 18th century. The primary prevalence of micro lending was once attributed to the Irish loan Fund method, presented by Jonathan Swift, which sought to fortify conditions for impoverished Irish residents. Micro credit is defined as provision of thrift, credit and other fiscal offerings and products of very small quantity to the bad in rural, semi-urban and concrete areas for enabling them to elevate their sales phases and fortify residing requirements. Micro credit score institutions are these which furnish these services. What role does a Non-Governmental Organisation (NGO) play in provision of Micro Credit? A Non-Governmental service provider (NGO) is a voluntary institution situated to undertake social Intermediation like organizing SHGs of micro entrepreneurs and entrusting them to banks for credit linkage or fiscal intermediation like borrowing bulk dollars from banks for on-lending to SHGs. Business Development Services: Support services that contribute to the growth of enterprises (e.g. business planning, client training, networking, and marketing technical support). Depth of Outreach: Extent to which financial services reach the relatively poor. Financial Sector: The sector of the economy that comprises financial institutions and financial markets. Financial Sector Deepening: The extent to which the financial sector serves a population in a country. Monetary assets to GDP ratio are the major indicator of financial sector deepening. Financial Self-Sufficiency: Total operating revenues divided by total administrative and financial expenses, adjusted for low-interest loans and inflation. In a microfinance context, an institution is financially self-sufficient when it has enough revenue to pay for all administrative costs, loan losses, potential losses and funds. (i) In general, firms and workers in the informal sector do not pay fees or taxes and the administrative procedures are simplified. (ii) It is difficult to protect the rights of the agents employed, as the informal sector does not always comply with the rule of law. Market Rate: The rate of interest borrowers must pay to borrow funds commercially. Program related investments generally are offered at below market rates or at no interest rate. Microcredit: A part of the field of microfinance, microcredit is the provision of credit services to low-income entrepreneurs. Microcredit can also refer to the actual microloan. Microfinance: Banking and/or financial services targeted to low-and-moderate income businesses or households, including the provision of credit. Microfinance is part of the financial sector. Microfinance Institution: A financial institution - can be a nonprofit organization, regulated financial institution or commercial bank - that provides microfinance products and services to low-income clients. Outreach: The number of clients that an institution serves. Private Sector: The part of a nation's economy that is not controlled by the government. Rural Finance: Financial institutions and their services that target those who live and work in nonurban areas and who are generally involved in agricultural-related activities. Rural finance can be a part of microfinance, while microfinance can also be a part of rural finance at the same time. 1. The poor need a variety of financial services: The Bank will support demand-driven microfinance interventions that develop and provide financial services. 2. Microfinance is a powerful instrument against poverty: The Bank will ensure that its operations support initiatives that increase the access of people in RMCs who are presently excluded from accessing quality financial services. 3. Microfinance means building financial systems that serve the poor: The Bank will support its RMCs to build such systems. 4. Financial sustainability is necessary to reach significant numbers of poor people: The Bank will support initiatives that help suitable intermediaries achieve financial self-sufficiency. 5. Microfinance is about building permanent local financial institutions: Dependence on concessional funding from such agencies as the Bank will only be temporary and diminish over time. The support of microfinance by the Bank will be contingent on intermediaries that are progressing toward, if they have not already attained, financial self-sufficiency. 6. Microcredit is not the only answer: In supporting microfinance in it’s the RMCs, the Bank will consistently establish that any resources applied to target groups and identified as credit will be extended through a viable institutional intermediary with a clear means of repayment at market rates of interest. 7. Interest rate ceilings debilitate the ability of all, but especially the poor, to access financial services: The Bank will support the ability of all RMC financial intermediaries to charge market rates of interest on loans. The Bank will further support the elimination of interest rate ceilings and the creation of more operational efficiencies to reduce MFI costs, thereby allowing them to reduce the rates of interest charged on loans. 8. Governments are to act as enablers, not as direct providers of financial services: The Bank will support RMC governments in defining the elements of the enabling environment necessary to mainstream microfinance into the formal financial sector. At the same time, the Bank will discourage RMC governments from directly funding people targeted by MFIs. 9. Funding agencies should complement, not compete with, private-sector capital: The Bank will provide selective support for initiatives with the objective of building inclusive financial systems. The Bank will, however, require a defined exit strategy at the outset of such support. 10. The absence of institutional and human resource capacity is the key constraint: The Bank will support building the institutional capacity of financial intermediaries to provide financial services in demand among people who do not have access to formal financial services. 11. Transparency in financial and outreach matters is important: Bank support to microfinance in the RMCs will help ensure transparency at all levels and by all institutions.
" 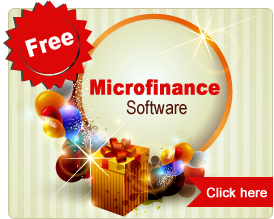 Very Thanks to Microfinancesoftware for creating such a useful product. It has streamlined and enhanced the quality of our service and it is very good to expand the business."